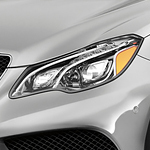 One of the most popular luxury sedans on the road today is the Mercedez-Benz E400. Its best in class design features have made it an easy choice for car buyers who enjoy the finer things in life. That is why our team of luxury sedan experts at Mercedes-Benz of Arlington are so excited to tell you all about the design features in the all new model! The steering wheel of this luxury sedan has been designed to be a full control center for the entire vehicle. This way, you are able to control anything from the temperature in the car to the volume of the radio all without lifting a single finger off of the steering wheel. Additionally, drivers will love the 12.3 inch panoramic display screen that is able to show everything ranging from a navigation tool to various other diagnostics of the vehicle in real time.